Thirteen years later, in 1787 another war against the Ottoman Empire starts. Suvorov, leading 25 000 Russian to the Rymnik River, Romania manages to cover the distance of 100km for just about 2 and half days. On September 22nd, 1789, for only 12 hours he completely destroys the Turkish army. The loss is a devastating blow for the Ottomans and their dead are about 20 000 men while the Russian lose no more than 600. For his outstanding and complete victory he is pronounced Count Rymnik and receives Order of St. George the Bringer of Victory First Class. A year later he captures another Turkish stronghold – Izmail after he has used its architectural plan to train his men to capture Turkish fortresses daily. In 1794, he is sent to Poland to quell an uprising, and Warsaw capitulates. After the death of Catherine in 1796, the new emperor Pavel I (Paul I) exiles Suvorov in the province. The new emperor was not a big fan of the training methods of the great general and reforms the military system in the Prussian manner. However, less than 2 years later, England and the rest of the European allies insist Suvorov takes command of the allied forces and stops Napoleon. Reinstated as a field marshal, Suvorov is sent to drive the forces of Napoleon out of Italian lands, leading the Austro-Russian army. He defeats all generals of Napoleon, who at that time is in Egypt. He wins against the GeneralS Moreau, MacDonald, and Joubert. He frees a number of Italian cities, leading 3 successful battles in Trebia, Novi, Cassano and a the Swiss Expedition. 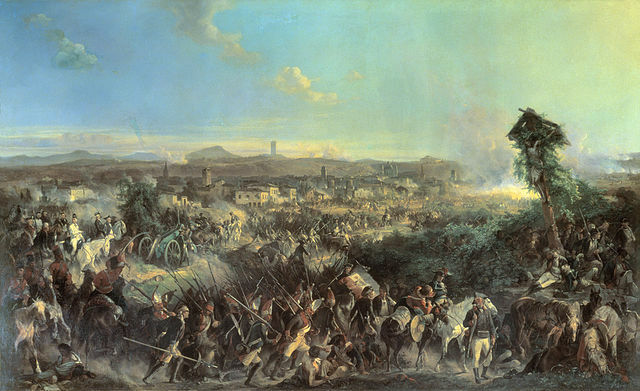 After he captures Milan the French forces are in full retreat. The King of Sardinia gives him the rank Prince of the House of Savoy and he also becomes a celebrated hero of the opposers of the French revolution. Yet, the European forces scared about the influence of the Russians on the continent, end the coalition against Napoleon and abandon them. After his astounding victories against Napoleon’s general, Suvorov is ordered to join the Russians in Switzerland and help them against the French. The Russian forces under general Korsakov are defeated shortly before Suvorov could reach his destination and unite with them. The French commander Massena surrounds Suvorov and his men with his 80 000 men army. At that time, 1799, Suvorov only has 23 000 soldiers and almost no supplies. His strategy is to lead a withdrawal, crossing the Alps and fight the French in the process. 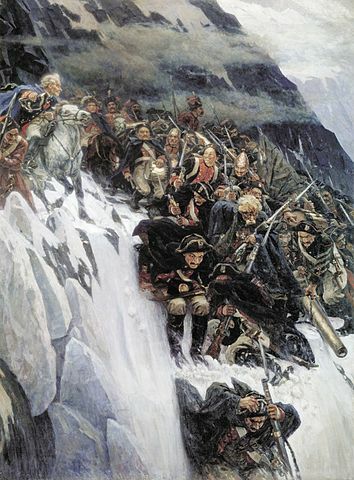 The march through the snowy Alps takes 2 weeks and the life of only one-fourth of the Russian soldiers, and Suvorov also manages to capture and take 2778 French soldiers alive to Austria. For his strategic withdrawal and performance during his service, he is titled the fourth Generalissimo of the Russian Empire. Alexander Suvorov dies on May 6, 1800, at the age of 69, a hero to his subordinates and fellow countrymen. On his own will, his grave is only marked with the words “Here lies Suvorov”. Prince of Italy, Count of Rymnik, Count of the Holy Roman Empire, Prince of Sardinia, Generalissimo of Russia’s Ground and Naval forces, Field Marshal of the Austrian and Sardinian armies. Order of St. Andrew the First Called Apostle, Order of St. George the Bringer of Victory First Class, Order of St. Vladimir First Class, Order of St. Alexander Nevsky, Order of St. Anna First Class, Grand Cross of the Order of St. John of Jerusalem, Order of Maria Teresa First Class, Order of the Black Eagle, Order of the Red Eagle, the Pour le Merite; Order of the Revered Saints Maurice and Lazarus, Order of St. Gubert, the Golden Lioness, United Orders of the Carmelite Virgin Mary and St. Lazarus, Order of the White Eagle, and Order of Saint Stanislaus.